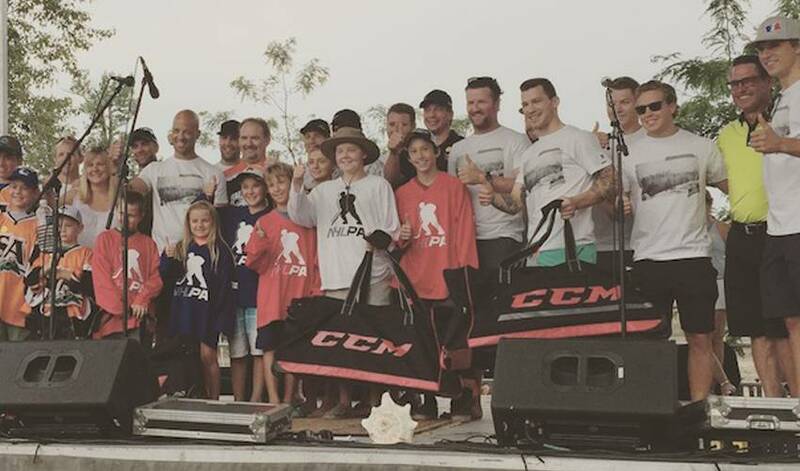 The 2015 NHLPA Summer Classic wrapped up Friday, July 10th with a Community Celebration featuring NHL players at Kalamalka Beach to benefit Vernon Jubilee Hospital and local grassroots hockey programs. Part two of the 2015 NHLPA Summer Classic kicked off Friday, July 10th at the picturesque Kalamalka Beach. The first ever NHLPA Community Celebration - in partnership with the City of Vernon, Predator Ridge, and Vernon Jubilee Hospital Foundation (VJHF) - brought together NHL players with over 2,000 local fans for a day of beach fun including paddle boarding, autograph and photo sessions with the players, volleyball, SUP polo, and live music. Through ticket sales, and a jersey auction made possible with NHLPA-donated jerseys, $7,000 was raised for VJHF. Emcee Kelly Hrudey, Mayor of Vernon, Akbal Mund, and approximately 20 current and former NHL players, including Scott Hartnell, Andrew Ference, Curtis Lazar, Jason Chimera, Cam Atkinson, Manny Malhotra, and David Booth were among the celebrities in attendance for the celebration and took part in many of the family-friendly activities. During the event, the NHLPA Goals & Dreams fund also made a very special announcement - a donation of over $50,000 worth of brand new hockey equipment to the Salmon Arm Minor Hockey Association, West Kelowna Minor Hockey Association, and Vernon Minor Hockey Association, providing each association with 25 new complete sets to aid in their local grassroots hockey efforts. Today’s fun at Kalamalka Beach marks the end of the NHLPA’s two-part, two-day Summer Classic event in Vernon, British Columbia following yesterday’s 23rd annual NHLPA Golf Classic that saw $100,000 raised for four great player-chosen charities.